Dhaka, March 28: In a major fire at a 24-story building of FR Tower in the capital of Dhaka on Thursday, seven people lost their lives and more than 68 have been reportedly injured. To douse the fire, 21 fire-fighting units were utilised and hours of struggle with the fire, the situation was brought in to control. The eyewitness claimed that they have seen several people falling down while trying to descend using cables along the periphery of the building, reports The New York Times. Confirming the number of people died in the fire, the officer in charge of the Banani police station in Dhaka – Forman Ali – said that one woman and six men had died. Also, among the dead, includes a Sri Lankan citizen. Adding more, Ali said at least 68 people had been injured and that the cause of the fire was still unknown. Tamil Nadu: Seven Dead After Crackers in Fireworks Unit in Mannargudi Catch Fire. With the reports of fire pouring in in the afternoon, employees of the multinational company on the 10th floor broke its windows and called for help. By the time people tried to evacuate the building with the help of staircase, smoke had darkened the office, making it difficult to breathe. As the fire climbed higher, more employees broke the building’s blue-coloured glass and screamed for help. Eyewitnesses say that at least eight people had tried to climb down near the eighth and ninth floors. 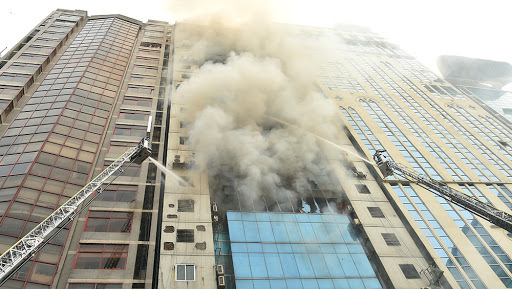 The incident reminds of the previous February fire at the commercial area of Dhaka, where 70 people were killed.